Collecting sensor data on an IoT system doesn't mean you have insight. This eBook looks at technologies that enable analysis of big data. This eBook is of most value executives that need to analyze the data coming off products into an IoT platform. Today, product development is more complex than ever. Technologies being integrated into products are advancing at a breakneck pace. Specialized suppliers with niche expertise are playing more prominent roles in development. Manufacturers are connecting to sensors in their products and streaming data to the cloud. Technical centers and manufacturing sites, both internal and supplier, are increasingly spread across the globe. In this increasingly complex environment, hints of early problems can arise from myriad sources, but they can be easily overlooked. Repetitive failures in a specific unit test might hint at an integration issue. Fit problems in test production runs might be a clue of tolerance difficulties. Higher than expected component rejection rates might be an early sign of a supplier’s inadequate quality procedures. If these and other issues aren’t caught early, they bloom into full-blown catastrophes, running a project off schedule and causing costs to skyrocket. Despite these challenges, executives are still expected to deliver high quality products on time and under budget. 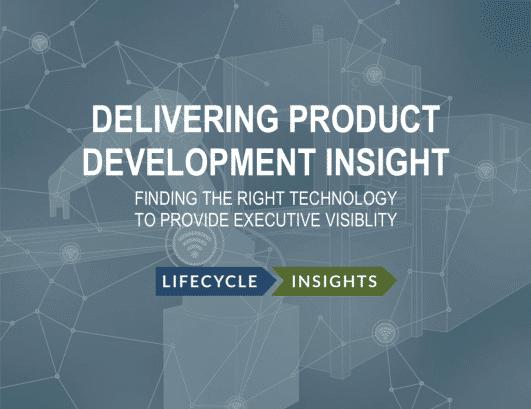 The means to mitigate the issues that can derail product development lies in executive visibility. Issues in development always have early hints and clues. If executives can catch those signs early enough, they can develop a corrective action plan to address them before those problems become a real threat. The trick, of course, is to find those trends as they emerge. Interestingly enough, the evidence of these product issues resides in something each company already owns: their big data. Clues exist in their enterprise systems such as Product Lifecycle Management (PLM), Enterprise Resource Management (ERP) and many others. Yet signs also can be found in the data companies are streaming from the sensors on their products as part of the Internet of Things (IoT) movement. However, it is not easy to uncover these hints and gain actionable insight. The challenge in gaining executive visibility into these issues is that those trends are buried in the vast amount of information that exists in those systems and sensor data. Executives need to be able to quickly, easily and flexibly traverse that information and data. While many of these enterprise systems provide powerful reporting capabilities that deliver value to numerous roles in development, they have limitations that curb their effectiveness in delivering executive visibility. In contrast, Product Data Analytics solutions provide the right mix for the job. Therein lies the purpose of this eBook. Here, you will find more details on the factors that increase the complexity of development. You will find more on the key capabilities needed to deliver such insight. Finally, you’ll find a comparison of PLM reporting and Product Data Analytics capabilities. It has always been a challenge to gain visibility in product development. However, with the right tools, it is now easier than ever before.